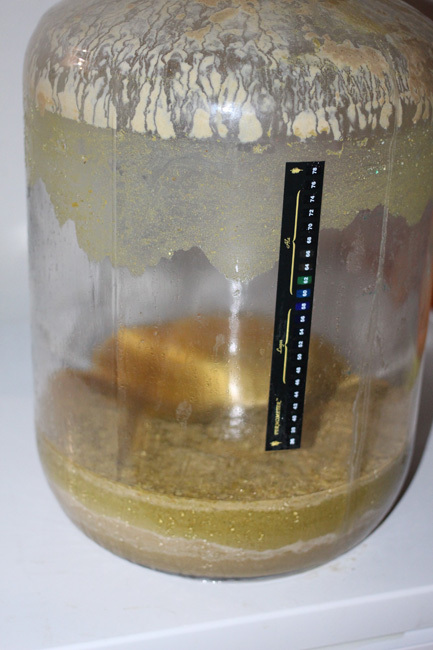 A few weeks ago, a gentleman from Southern Hills Homebrew Supply in Roanoke, Virginia made an interesting post on /r/homebrewing about how he had taken a large number of expired yeast vials (twenty-five strains, to be exact) and had made combined them into a gigantic five gallon "starter". All told, he had combined fifty-nine vials of yeast (most of them English or American in origin, with a couple from Germany), and was planning to simply give away the resulting blend to anyone who wanted to drop by his shop and pick up a sample. This immediately piqued my interest, but Virginia isn't exactly a quick drive from me here in Alabama, so I shot him a message to ask if he would consider sending any via mail. He was up for it, and before long, I was the proud owner of a recycled White Labs vial now filled with this blend he had naturally dubbed "Frankenyeast". It should come as no shock that a potential Frankenyeast brew shot to the top of my "to brew" list... though I needed to figure out what, exactly, I planned to brew. At first, I had thought I would focus on something malt forward, something maybe lower in gravity, something to let the yeast shine. My thoughts turned to pale ales, maybe my first shot at a British Golden Ale... but before long, the brewing muse grabbed me with the idea of a super fruity IPA to play well with what I assumed would be some potentially serious fruity esters from the yeast. I went with a fairly simple grist, with this being one of the few beers I've ever brewed with exactly zero c-malt additions (though my LHBS guy considers honey malt to still be a c-malt, for whatever that is worth). I decided that I wanted to feature El Dorado, one of my absolute favorite hops, and that I wanted to pair it with something to really push the "fruity" aspect without bringing in any citrus or piney elements to the aroma. I get a lot of candy-like fruit from El Dorado, and I was thinking that a good pairing could yield a unique beer. My thought was that the yeast might end up tossing a ton of fruity esters, and that I might end up with some super interesting "fruit salad" aspects if I could play my cards right. As it turned out, this was a lot tougher than I had expected it to be, as a majority of hops described as "fruity" seem to have some serious citrus components to their aroma and/or flavor. Galaxy came up, but my last IPA had a lot of Galaxy in it, and I wanted some different character in tis beer. Mosaic was suggested to me as a berry bomb, but to be quite honest, I've gotten a fair amount of pine/dank from Mosaic (and very little berry)... which, again, I wasn't wanting in this beer. Finally, I settled in on Calypso. I placed my order with the LHBS... and found out that they were basically out of that hop. So, I went with Azacca as a substitute. Naturally, the LHBS had even less of that variety. It's best to be sure. Life is even crazier than normal around my house at this time of year; I'm coaching not one - but two - little league baseball teams, my oldest son was getting ready to graduate high school, Mother's Day was happening... and my trusted cooler conversion mash tun decided to completely fail after three years of loyal service. The rubber washer inside had deformed to the point of utter uselessness, and nothing I could pick up from Lowe's seemed to do the trick. I ended up having to postpone my brewday a bit; I pulled my starter flask off of the stirplate and stuck it in my fermentation fridge, then ordered some food safe silicone from Amazon. Three weeks and a couple of liberal applications of silicone later, I was finally ready to brew. Two days before my new brew day, I woke up my starter with another half liter of wort, just to be sure, and off I went. Those who are familiar with my blog are certainly well versed in my typical brewing misadventures; if you are reading along for these, let me go ahead and warn you - my brew day went shockingly smooth. All of the leak issues for my cooler were gone, and as always, the Brew Bag that I now use exclusively as my filter made the process a breeze. I did mash in at almost one whole degree warmer than I had planned, but that hardly counts as a typical Olan catastrophe. 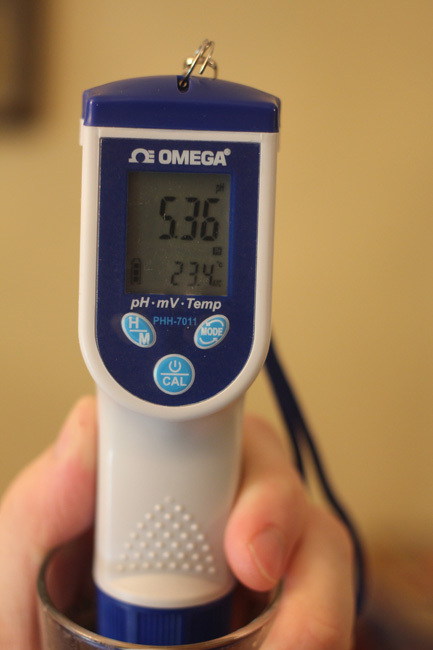 My mash pH was four hundredths off of my target (5.36 vs a target of 5.32) - again, nothing to complain about. When your reading is within the stated accuracy of your meter, you call that "spot on". 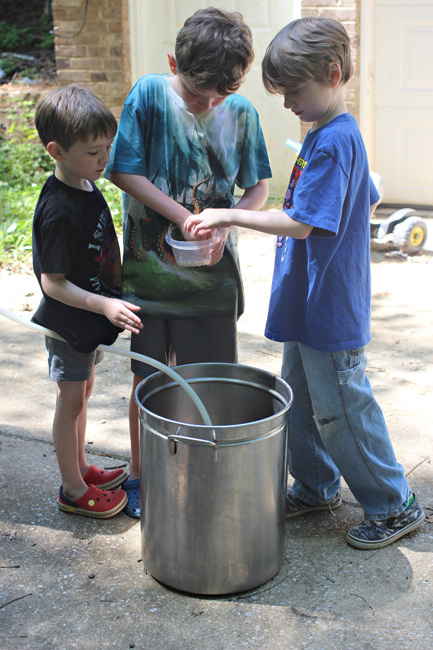 My boys were excited, as I would be doing three hop additions on brew day (first wort, ten minutes, and flameout) - which meant that each of them would get a chance to dump the final few pellets of the addition into the wort. For whatever reason, that's a big deal to them. 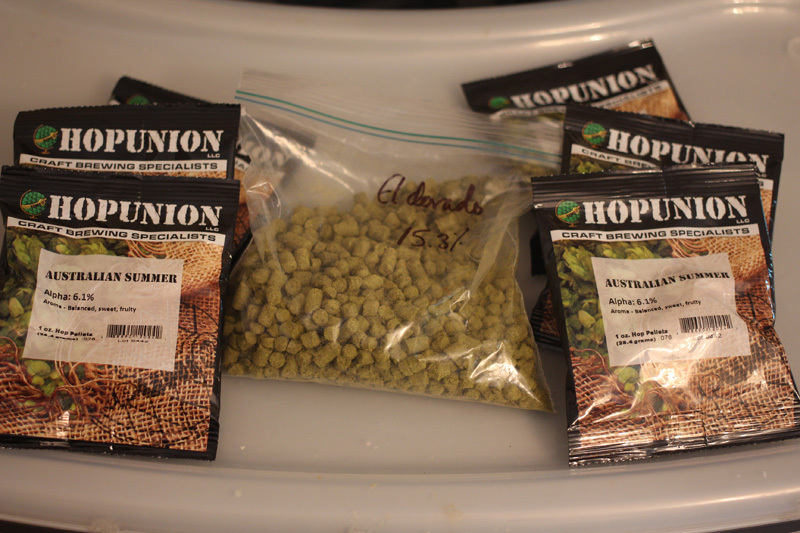 For the record, I got perfect hop additions from them, with zero foreign item (such as sticks) introduced. Adding hops is serious business. Once the twenty minutes of flameout/whirlpool addition time was met, I cooled the wort as always with my Hydra chiller - I was down to about 70 degrees F in under six minutes. I nailed my volume exactly (the wort was directly on the 5.5 gallon line of my carboy), and missed my OG by all of one point (1.063 actual instead of the 1.064 target). As is my custom, I oxygenated with pure O2 for sixty seconds, then pitched my decanted starter (though I did, of course, save a vial of the yeast for future brews). This beer did have some pretty striking striations, though that's not terribly uncommon in hoppy beers. Into the ferm chamber the beer went, with me setting the STC-1000 for 18.3 C/65 F. I did have a minor hiccup here, as I had allowed my ancient mini fridge to frost over pretty heavily, and had failed to defrost it prior to fermentation. You guessed it - the next day, the beer was quite cold (about 56 F), so I left the door open to let things warm up (and allow the frost to melt and make a giant puddle on my basement floor). 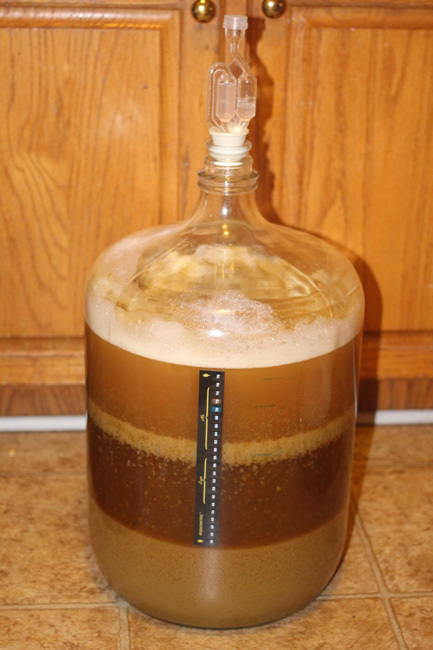 The cool beer had already started to form a thin krausen, however, and I did have slow airlock activity. Within 24 hours, things had drastically improved; I hit my target fermentation temperature (and stayed within about a half degree F of it for the duration), and the krausen got much bigger. 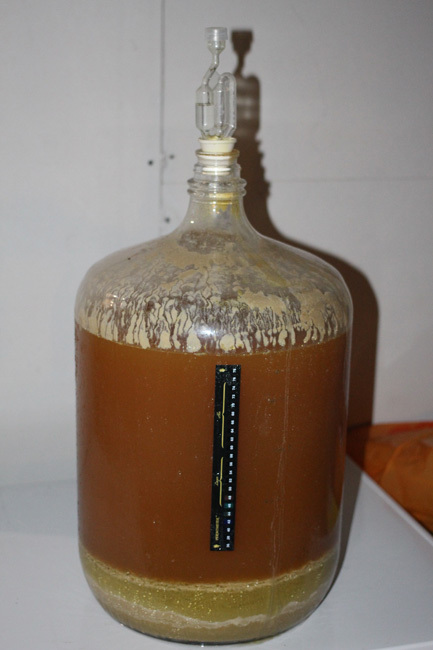 It took basically five days for fermentation to complete, which was a bit longer than I had expected it to take. I let the beer sit two more days for good measure, then dry hopped with four ounces of El Dorado and four and a half ounces of AU Summer. Also, at this point, I added four ounces of table sugar boiled in a cup of water - the idea being that the small amount of extra fermentation kicked up would scrub any oxygen introduced with the hops. After three days, I started to cold crash; twenty-four hours in, I was under 40 degrees F, so I added a half teaspoon of gelatin in a quarter cup of water. These two steps have always led to insane clarity in my beer, and while I'm not terribly worried either way, I do enjoy knowing that I *can* get the beer clear. Another twenty four hours later, I kegged the beer (hitting my predicted FG of 1.013 right on the nose), set the regulator to forty-five pounds of pressure, and left it for one final twenty-four hour period before cutting the pressure down and pulling my first pint. I ended up losing less than a gallon of beer to trub, hop junk, etc - not bad, considering that I dump everything into the fermentor, and that I used twelve ounces of hops in this one. No drinkable beer left behind, but no crap in my keg, either. Finally, the big day arrived. 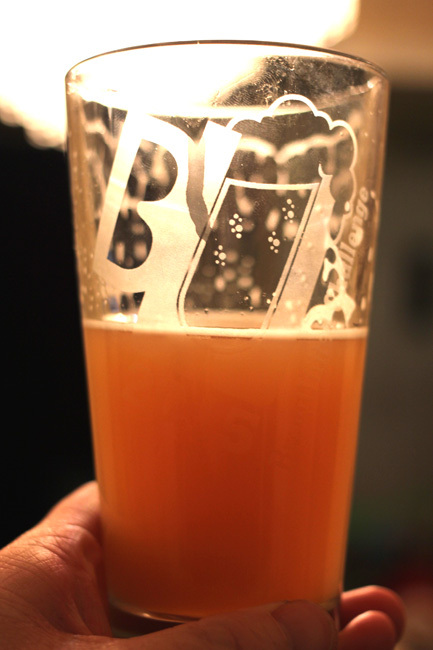 I gave my favorite BrewUnited Challenge pint glass a fresh salt scrub, rinsed it well, vented the keg and set it to serving pressure. Then, with bated breath, I pulled my first pint of this experimental beer. Now, I'm well aware that even the most carefully siphoned beer is still going to bring across a little crap, and as such, the first couple of pints are always going to be a tad bit cloudy. This beer, on the other hand, wasn't a tad bit cloudy. Seriously, I've brewed stouts that conducted light more freely! In the glass, this beer reminds me of the refractive quality of orange juice, save the fact that the color is golden rather than orange. Banana juice? Apricot juice? It certainly doesn't look like beer! There's cloudy beer... and then, there's fruit juice in a pint glass. Ah, well. I'll just pretend that I was trying to brew a New England style IPA, and I didn't resort to any cheap tricks like adding flour to get the effect. I've had it pointed out to me that the Frankenyeast blend included Wyeast 1318, and that it (and likely some other strains) are "are biotransformation capable and also susceptible to the flocculation interruption of dry hopping." Which I take to mean "can lead to serious lack of clarity". And also, that I apparently need to educate myself a little more when it comes to yeast. But enough of the appearance factors. If we served this beer out of a red Solo cup, ala Brulosophy style blind testing, what would we think of it? If I had to pick one word to describe the beer, I'd go with "incredibly unique". Okay, two words. I've brewed several IPAs, and have tried every commercial variety I could get my hands on over the past couple of years, and I've never had a beer even close to this one. The aroma doesn't have quite the huge punch that I was hoping for, though it is still quite strong. What it does have is an amazing, unique, candy-like melon character to the aroma. There might be a hint of pear or apricot, but by and large, it's honeydew/watermelon/generic melon-y combined with this sweet candy character. I've never smelled anything quite like it. The flavor is likewise strikingly unique. The beer is a tad sweet up front, with this just huge burst of melon flavor, a little apricot, before giving way to a nice, rounded IPA bitterness. There's enough malt to balance things out to the point that it's not JUST hopwater, but the hops definitely run this show. With that said, I swear that if I didn't know better, I would be certain that this beer had been sitting on some serious quantities of fruit! Weighing in at 6.57% ABV, this beer is still remarkably drinkable. I do get gorgeous lacing in the glass, and while the head is currently "okay", I expect to see that improve with a few more days in the keg. So far, all three pints I've pulled of this beer have been identical. I have serious doubts as to how much this beer will clear - and to be quite honest, I'm not sure that I still want it to do so. While it's fun to point out that you can read a magazine through a pint of most of my beers, it's perhaps more fun to pull a pint of a beer that looks for all the world like fruit juice. I'd have to say that, when all is said and done, this beer was a resounding success, and one that I will very much enjoy drinking (and sharing). I don't know how much of the aroma and flavor came from the hops versus how much came from the yeast, or if this is one of those situations where the total is greater than the sum of its parts... but for now, I'm just going to enjoy this beer. I do fully expect future rebrews to differ a bit, as I doubt I'll be able to maintain the ratio of yeast strains in my harvested vial; I'll surely see more than a little drift over future generations. In the meantime, I'll going to enjoy this amazing, unique beer. Who knows? Maybe this crazy blend can become some sort of house strain. Once again, special thanks go out to Southern Hills Homebrew Supply in Roanoke, Virginia, for providing the unique yeast for this recipe! Save that strain!!! Hazy IPA's are the latest debatable topic just look up Denny's blog. Try Weedy's new recipe at Blue Pants Brewery for an example.